Another new industry will locate in Watertown in the very near future, it was announced today. The Durant Manufacturing Company of Milwaukee, manufacturers of industrial counting and measuring machines, today announced its decision to erect a branch plant of 22,000 square feet in Watertown. Location of the plant will be at the northeast corner of Clark and South Twelfth Streets on a seven acre plot of land which has been turned over to the Milwaukee concern by the Watertown Association of Commerce Promotive Corporation, an organization which was formed some years ago by Watertown merchants for the purpose of promoting industrial expansion in the community. Construction of the branch plant of the Durant Manufacturing Company of Milwaukee is well underway. Steel structural work has been completed and mason work has begun. The plant will contain 22,000 square feet and will be erected at a cost of $160,000. Maas Bros. have the general contract. The building is scheduled for completion before the end of the year. The branch plant of the Durant Manufacturing Company of Milwaukee is scheduled to begin operations here on Monday, Feb. 11. Equipment now is being installed and final work on the interior of the building is now nearing completion. The building covers an area of 22,800 square feet, of which 18,000 square feet will be used for production. The building is being erected at a cost of $160,000. Maas Bros. of this city have the general contract. The Durant Manufacturing Company has purchased a little over six acres of land immediately to the south of its plant on South Twelfth Street, it is announced by officials of the Watertown Association of Commerce Promotive Corporation from whom the land was acquired. Acreage obtained is part of a 20 acre plot which the promotive corporation acquired a number of years ago so that fine industrial sites would be immediately available to industries interested in locating in Watertown. The plant facilities of the Durant Manufacturing will be more than doubled with the construction of an addition of 31,500 square feet, it was announced by William Winkler, Milwaukee, president of the firm. The plant is located at South Twelfth and Clark Streets. Cost of the addition will be approximately $280,000. The local branch plant of the Milwaukee firm was completed early in 1957. It contains 25,000 square feet of floor space. The new addition to the plant of the Durant Manufacturing Co. in Watertown has been approved and a building permit has been issued, it was reported today. The estimate listed on the application totals $137,628 and will be part of the recently announced plans for expanding the present plant and operating facilities of the company. New building took a drop this month in the number of applications for permits. Two new homes are included in the short list of projects approved. In line with the company’s recent move of its manufacturing operations to a new plant in Watertown, Durant Manufacturing Company today announced a major personnel change within its organization. Willard H. Brown, formerly plant manager of the Milwaukee factory, has been appointed manager of manufacturing, supervising the company’s entire manufacturing operation now located in Watertown. Mr. Brown joined Durant in 1956 as plant manager of the Milwaukee factory. He is a graduate mechanical engineer from the University of Wisconsin (1946) and came to Durant from the Midland Company of South Milwaukee, where he had been vice president in charge of manufacturing. The Durant Manufacturing Company, manufacturer of industrial and instrument counting devices, today announced a broad expansion program in its engineering department, which includes the development of a separate research and development section and the appointment of a special projects engineer. Under the new organization, Walter W. Hoffmann will be manager of production engineering group, which will be devoted entirely to the improvement of standard models in the Durant line and the development of counters for special customer projects that are related to the standard line. Mr. Hoffmann has been with Durant since 1948 and is a graduate of the Illinois Institute of Technology. The Durant Manufacturing the introduction of a new printing recorder which is designed to meet a long felt want. Company officials said that many industrial plants, processing plants, and research department have developed a need for an instrument which will printout important data, yet be practical, foolproof and within economical reach. A Watertown firm, Durant Manufacturing Company, played a role in the 22 orbital flight of Major Cooper. The local firm, manufacturer of counting instruments, introduced the first digital readout line of counters for aerospace work and is the second largest counting instrument maker in the country. The counters such as the one used in Cooper’s space ship, were used to record Cooper’s flight time for TV viewers. Durant’s plant is located on South Twelfth Street. It is one of the new industries which located in Watertown in recent years. It moved its plant here from Milwaukee. The Durant Manufacturing Co., through its Milwaukee office, announced today that it has found its most satisfied customer right here in Watertown where Durant operates a plant. The customer is the Globe Milling Co. In 1879, W. N. Durant conceived the idea of a mechanical counting device to tally bags of flour at the Milwaukee Rolling Mills. Thirty-seven years before that, in 1842, one of Watertown’s very first industries was established. Recently representatives of these two companies, now only blocks apart in Watertown, had reason to join together to look back through some of those years. Durant manufactures counting and controlling instruments and Globe is a producer of rye flour. The occasion was brought about by the discovery that several early model Durant counters were still being used at the Globe Milling Co. Mill. The facilities of the Durant Manufacturing Company will be expanded by an addition of 12,000 square feet. Announcement of plans to erect another unit were made to employees shortly before noon today by William Winkler, president of the company. The latest addition will join to the east the second unit which was placed in operation on June 15, 1961, when the first unit and the second unit were combined in a ribbon cutting ceremony. 06 04 The Durant Manufacturing Co., Watertown and Milwaukee, today revealed a new role the firm is playing in the aerospace program, including the current Gemini mission which today sent two astronauts into what is to be an epic 62-orbit flight with the Gemini-4. The firm’s role during the four day flight will be primarily one of education. Durant is a manufacturer of precision, counting and controlling instruments and has been a major contributor of components for ground support and missile control. The Durant Manufacturing Co. has announced plans for an addition to its Watertown plant, 96 by 1290 feet, costing an estimated $111,800. That sum is the estimated cost, according to the building permit issued at the office of City Building Inspector Orville Rettig. Mr. Rettig also announced that a permit for the general construction of the Riverside Junior High School has been issued to Maas Bros. Construction Co. of Watertown. The permit for that part of the work lists the sum of $1,111,100. The cost of the entire project, according to contract quotations at the time bids were opened and adjusted, will be well over $2,000,000. The Durant Manufacturing Company party was held at the Turner Hall on Saturday evening. Receiving 10 year awards given by R. B. Winkler, executive vice president, were: Ruby Sykora, Doris Hilgendorf, Dorothy Schultz, Lillian Grunewald, LuVerna Jansa, Ewald Strehlow, Helen Zwieg, Gloria Kaercher, Warner Oppermann, Virginia Fries, Malinda Zastrow, Merlin Will and June Oiler. Receiving 20 year awards given by W. W. Winkler, company president were: Lance Tews, Charles Mantel, Dolores Ketelhohn and Ursula Zemka. Receiving a 25 year award also given by W. W. Winkler was Raeona Black. Dur-Jac is one of two Junior Achievement companies sponsored by Durant Manufacturing Company during the current program year. Meetings are held Tuesday evenings at the plant on South Twelfth Street. Members of the miniature corporation have been recipients of the “Company-of-the-Month” award for two consecutive periods since the start of the program in October. The award is made on the basis of member attendance at regular meetings, and good business practice as reflected in accounting procedures and overall financial condition. Present company membership totals 18, comprised of both juniors and seniors from the local high school. The firm is engaged in the manufacture and marketing of an automotive safety flasher which they have been distributing through door-to-door sales in the city of Watertown. The Durant Manufacturing Company, which has its manufacturing plant in Watertown at the intersection of Twelfth and Clark Streets, will become a subsidiary to Cutler-Hammer, Inc. of Milwaukee. Announcement of the planned sale of the Durant firm to the Milwaukee concern was made at 3 o’clock Monday afternoon by William Winkler, Durant president, to employees gathered in the company cafeteria. Winkler said that the transaction was not completed as yet, but that he expected it would be in the next four to six months. The Durant Manufacturing Company, a leading producer of industrial counting devices with headquarters in Milwaukee, announced a basic realignment of its engineering staff in its main plant in Watertown. Enno A. Kneif has been named manager of digital systems products, a new position, and W. H. Kimble has been named manager of counting instruments engineering, also a new position. Kneif, a native of Wisconsin Rapids, joined Durant in 1959. He holds a Bachelor of Science degree in electrical engineering from Valparaiso University. His career includes extensive work in research and development at Minneapolis-Honeywell, the General Electric Flight Propulsion Laboratory and GE X-Ray. Kimble, a native of Chicago, came to Durant in 1963. He holds a Bachelor of Science degree from Michigan Technological University, Houghton, Mich. Prior to Durant, he was chief product design engineer for the Brillion Iron Works, Brillion, Wis., and design engineer for the Production Instrument Company of Chicago. that the transaction was not completed as yet, but that he expected it would be in the next four to six months. Plans by Cutler-Hammer, Inc., Milwaukee, to acquire the Durant Manufacturing Co., which operates a plant in Watertown, first indicated in reports several months ago, have now been completed according to an announcement made in Milwaukee yesterday. Officials of the two companies said the acquisition was completed with the exchange of 156,500 shares of Cutler-Hammer common stock for the business and assets of Durant. Durant, which makes measuring and counting instruments, will continue to operate as a separate organization in its present locations and with its present officers and staff. The company organizationally will be a part of Cutler-Hammer’s Specialty Products Division. Durant Manufacturing Company, Milwaukee and Watertown, has redesigned its corporate logo and name to “Durant Digital Instruments, A Cutler-Hammer Company.” The new design identifies Durant as a maker of digital instruments rather than counters, and as a division of Cutler-Hammer. Durant’s product line has been adapting to the sophisticated needs of modern industry — a long step from the mechanical counter the company first made 89 years ago to count bags of flour. Today, Durant’s digital instrument systems have important roles in a wide range of processing and manufacturing industries. The company now manufactures entire groups of mechanical, electromechanical and electric counters — and complex Unisystems and digital clocks which have wide use in automation. Apollo Astronauts read vital fuel supply and control information from instrument counters by Durant Digital Instruments, a Milwaukee and Watertown based firm. Digital display counters by Durant Digital Instruments — A Cutler Hammer company — will accompany Astronaut David Scott in the command vehicle Feb. 28 on the Ninth Apollo Flight to practice rendezvous and docking in earth orbit. Two high speed “Y” instrument counters, capable of 2,500 c.p.m., are installed in the display gauge at the control panel, facing the astronauts and measure percentages of fuel and oxidizer remaining in the propellant tanks. This digital readout also enables the Astronauts to control mid-course firing schedules. Durant Digital Instruments marked 25 years of operation within the Watertown community. 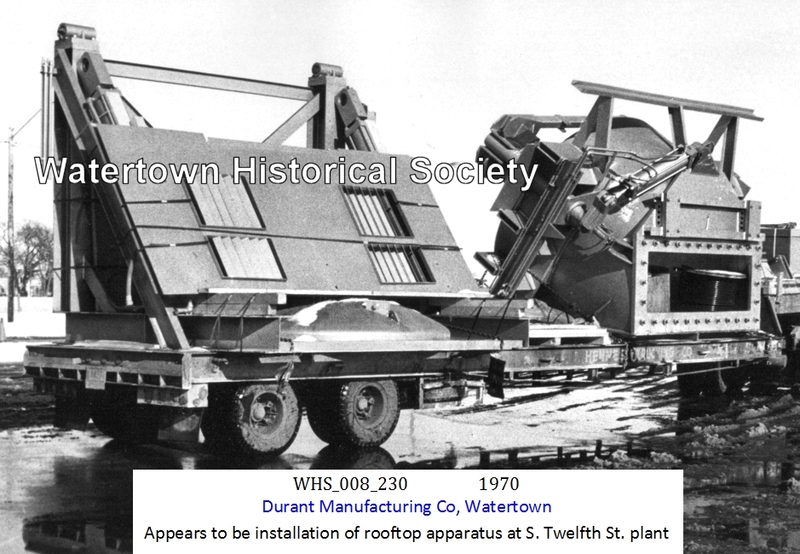 Durant came to Watertown in 1957 when a 25,000 square foot facility was erected on Twelfth Street, on land acquired from the then Watertown Association of Commerce Promotive Corporation. Burt Sweitzer was one of a small group of Durant engineers and managers transferred from Milwaukee to open the Watertown plant in 1957. The company expanded its facility in 1961, 1963, 1969, 1974, 1978 and 1979. Today  the Durant operation boasts 138,000 square feet. Jerald J. Theder, general manager of Eaton Logic and Communications Products Division, is returning to the board of directors of M&I Bank of Watertown, according to announcement today by Gerald Flynn, president of the bank. Theder served on the board of directors in 1975 and 1976 before accepting a new position with Cutler-Hammer Company, then owner of Durant Digital Instruments in Watertown. That new position took him to Cleveland, Tenn. He succeeds E. James Quirk as a member of the board. Quirk, retired chairman of the board and president of Brandt, Inc., left the bank’s board of directors last October. Eaton Corporation’s Watertown plant management has announced a major employee compensation repositioning program that will become effective at the plant on Jan. 1, 1986. Robert Stasey, Watertown plant manager, announced in a written statement today that the purposes of the re-positioning were to maintain and increase job opportunities in Watertown. “That means we must do things differently than we have in the past, with programs that reward group efforts and recognize total team involvement,” the statement said. Steven Sheppard, the plant’s human resources manager, explained the benefit changes that he said will make the Watertown facility “an all-salaried plant, with all employees sharing in the same benefits and pay grades competitive within its industry.” Sheppard said the Eaton Corporation considers the Watertown plant a “cornerstone facility,” and intends to expand the plant’s electronics capabilities. A veteran of 108 years, the Durant division of Eaton Corporation has used some of the same principals of the original Durant Company to compete successfully in today's tough international market. Whether its 1987 or 1879, a successful business is one that can satisfy the needs of its customer. According to Jerald J. Theder, manager of Eaton's automation products division, Durant has turned its fortunes around in the 1980s by doing just that. "Durant also was a company that focused on serving the needs of the customer where the needs were a little bit out of the ordinary," said Theder, who manages plants in Watertown and Riverton, Wyo. Eaton-Durant has become one "of the leading manufacturers of counting devices in the world by doing top-level work in satisfying customers. The company has kept its original focus on serving its customers while, at the same time, dramatically changing its product lines. The mechanical counter that founder W.N. Durant first sold in 1879 to the Milwaukee Rolling Mill to count bags of flour is a far cry from the electronic devices used to measure the flow of chocolate chips in a cookie factory today. Eaton-Durant today makes electronic and electromechanical counters for a wide range of applications. The company will also custom make counting devices on demand. Theder said the company's recent success stems from a structural reorganization at Eaton-Durant about three years ago, a change that transformed the company from a rigid manufacturing firm to a flexible company that can adapt minute by minute. That change has made the Watertown firm more responsive to customers' needs, better able to solve problems and provide service, he said. Eaton-Durant has become more flexible by giving its employees more say about their working conditions and, at the same time, more responsibility. For example, the company has enacted a gain sharing plan in place of the piecework incentives used previously. After the division reaches the goals set in its profit plan, any additional profits are divided equally among employees. All employees are paid on a salary basis rather than an hourly wage. Everybody also receives the same fringe benefit pack-age. And top executives don't receive any special perks. For example, no one has an assigned spot in the Eaton parking lot. Workers also have greater input in running the plant. Every department, depending upon the number of people who work there, receives a certain number of delegates. Those representatives meet to discuss company plans and make decisions. As a result, workers feel more important and have more incentive to provide quality work. In the past, Eaton-Durant employed about 40 product inspectors but now no longer needs them. The new emphasis has made Eaton-Durant more competitive in a tough world market. After a peak of about 500 employees at the end of the 1970s, the Watertown plant laid off a number of employees but has rebounded to about 300 workers today. In this country, Eaton-Durant is one of two top manufacturers of counter equipment, along with Veederroot Co. of Hartford, Conn. In fact, those two companies are the only two still operating in 1987 that were listed in a register of counter manufacturers from 1905-06. Durant was founded by W. N. Durant in Milwaukee to meet a growing need for counting devices. Starting with the flour bag counter, the company developed counting devices to be used with a wide range of new and more complicated industrial machines. The technological explosion which followed World War II increased the demand for smaller and more sophisticated counting instruments, leading Durant to explore new areas of count-control equipment. In 1958, Durant introduced a complete family of high-speed counters for use as digital readout indicators in military and industrial instrumentation. In 1964, the company developed a line of new electro-mechanical counters. The biggest change came in 1969 with the advent of solid-state electronic counting equipment. Immune to electrical noise, the solid state systems were much more sophisticated than the previous models and could work in environments and at speeds not possible with the older product lines. Eaton is the leading producer of totalizing counters for gasoline pumps. The firm also makes mechanical odometer clusters for trucks and off-road vehicles. "The mechanical counter lives on and it always will because it is the lowest cost measuring device that we or anybody else in the world knows how to build," Theder said. But, Eaton-Durant is on the cutting edge of the new technology in counter equipment as well. Electronic flow meters are made for a wide variety of applications, from measuring crude oil to regulating conveyor belts for bread ovens. A relatively new field Eaton is entering involves devices to monitor quality control in manufacturing. Currently, Eaton-Durant makes equipment used in the automotive industry to monitor the assembly of car engines. The device provides information about critical joints in the motor and the stress on bolts, for example. The Durant Company started its Watertown plant in 1956 with a pilot program, assisted by the Watertown Area Chamber of Commerce. The plant was located at its current site at Twelfth and Clark streets, starting with 25,000 square feet. Eventually, through a number of expansions, the Watertown facility has grown to 125,000 square feet. In 1972, Durant expanded its office space in Watertown and eventually moved its executive and sales offices from Milwaukee, consolidating its operations here. The firm has experienced several changes in ownership over the years, starting in 1968 when Cutler-Hammer purchased the business. Eaton took over for Cutler-Hammer in 1979. Eaton, a worldwide manufacturer of advanced-technology products for automotive, electronics, defense and capital goods markets, employs 43,400 workers in 140 facilities in 20 countries. In 1986, the company had sales totaling $3.8 billion.